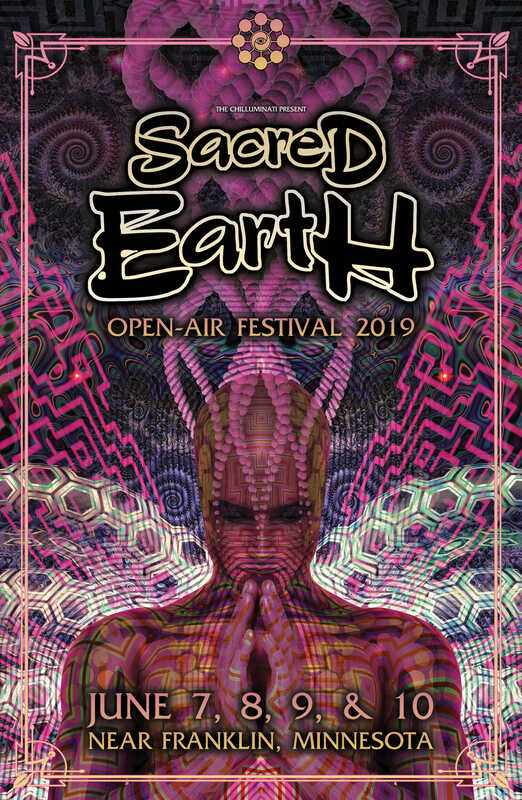 Sacred Earth Open-Air, our longest running festival, is created as a “Cosmic Condensate” in which our music, motion, light and love form a structure in space and time to create a microcosmic celebration of the infinite. Multiple stages of world-class visuals & art and musicians from all over the world to take you on a voyage through space, hyperspace and the dreamtime through Goa trance, psytrance, full-on, neuro, progressive trance, forest, hi-tech, ambient, PsyDM, world, downtempo, atmospheric, experimental and everything in between. We invite all to come dance, relax, join our community workshops and explore the wonder for 4 days and 3 nights on private property in rural Minnesota. Sacred Earth Open-Air, our longest running festival, is created as a “Cosmic Condensate” in which our music, motion, light and love form a structure in space and time to create a microcosmic celebration of the infinite. Multiple stages of world-class visuals & art and musicians from all over the world to take you on a voyage through space, hyperspace and the dreamtime through Goa trance, psytrance, full-on, neuro, progressive trance, forest, hi-tech, ambient, PsyDM, world, downtempo, atmospheric, experimental and everything in between. Come celebrate this phenomenon of the cosmos with The Chilluminati as we continue in our 14th year of bringing psychedelic trance music, tradition and culture to North America. .:. St. Petersburg, FL .:. .:. Chilluminati .:. Chicago, IL .:. .:. leftchannel .:. Columbus, OH .:. .:. FAZE 2 Solutions/Maharetta Rec. .:. Denver, CO .:. .:. OmunityMoons .:. Salt Lake City, UT .:. .:. Plush Industries .:. Milwaukee, WI .:. .:. Chilluminati .:. Minneapolis, MN .:. .:. Deepdharma Technologies .:. Iowa City, IA .:.
. :.Zod Records .:. Milwaukee, WI .:. .:. Audiognomes .:. Madison, WI .:. .:. Anomalistic Records .:. Elephant Island, AN .:. .:. Green Bay, WI .:. .:. Spacecamp Psyfari .:. Sacramento, CA .:. .:. Eldritch Crew .:. Evansville, IN .:. .:. Sangoma Rec .:. Indianapolis, IN .:. .:. Abstrakt Xpressions .:. Minneapolis, MN .:. .:. ZFG .:. St. Petersburg, FL .:. .:. Zero1 Music .:. Amsterdam, NL .:. .:. Chilluminati .:. Milwaukee, WI .:. .:. PaRvati Records .:. La Jolla, CA .:. .:. Apart & Plush Industries .:. Minneapolis, MN .:. .:. Looney Moon .:. Amsterdam, NL .:. .:. Indigo Presents .:. Portland, OR .:. .:. Pulse SF/Sculpted Sounds .:. Los Angeles, CA .:. .:. Iboga Records .:. Kensington, CA .:. .:. Deepdharma Technologies .:. Austin, TX .:. .:. Kajunga Records / Clave House .:. Minneapolis, MN .:. .:. St. Louis, MO .:. .:. Anomalistic Records .:. Cedar Rapids, IA .:. .:. STG Soundlabs .:. Peoria, IL .:. .:. Chilluminati .:. Denver, CO .:. .:. Psyde Effect Records .:. Minneapolis, MN .:. .:. Full Circle Productions .:. Ukiah, CA .:. From Minneapolis, it will be visible between 21:43 and 04:38. It will become accessible at around 21:43, when it rises 7° above the south-eastern horizon, and then reach its highest point in the sky at 01:13, 22° above the southern horizon. It will become inaccessible at around 04:38 when it sinks to 7° above the south-western horizon. Is it possible to bring in small motorhome?